. @TeddyOutReady: Learn about #CircleSquare Ranch and win a trip to fabulous Punta Cana. Learn about #CircleSquare Ranch and win a trip to fabulous Punta Cana. Summer is fast approaching and the first words coming to my mind are summer camp. When I was a kid I spent almost all my summers at the camps. Fun activities, new adventures and discoveries, camp fires, walking trips just to mention a few how my summers were. I was so happy to leave the school for a while heading to a camp, meeting new friends and just being active all days long. So I was excited to learn about Circle Square Ranch, an overnight kids camp that has been operating in Canada since 1978 and offering locations in Alberta, Saskatchewan, Manitoba and Ontario. These Christian camping centres are dedicated to the children and youth in Canada providing incredible adventures in horseback riding, swimming, crafts, archery, zip line, wall climbing, ropes course, mountain biking and many others just check their locations sites. 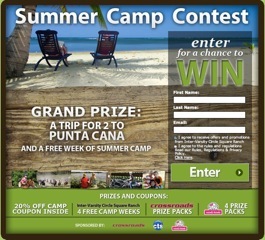 Besides being a great summer camp for kids and teens, Circle Square Ranch is also offering a chance to win a Trip for two to Punta Cana as the grand prize and secondary prizes one week free camp (which is fabulous!) and Mabel’s Label Kit. Entering the contest is easy, just fill out your first name, last name and e-mail address. There are also special offer bonus coupons available during the registration for Mabel’s Labels, Crossroads and discounts for first-time campers. You can also increase your chances of winning by sharing the giveaway on Twitter, Facebook and e-mail with your friends so that they participate too.